So funny, so gross. See his filthy beard and her glass eye in Quentin Blake’s colour art. 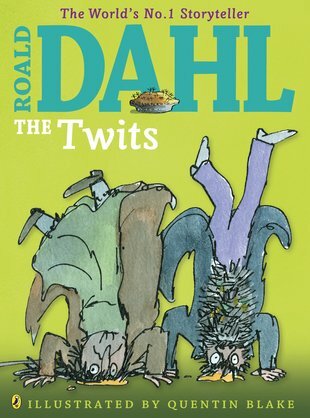 It’s the Twits as you’ve always secretly wanted to meet them. In awesome full colour. Now you can inspect the exact yucky brown of those mouldy cornflakes in Mr Twit’s beard. Long before Mr Gum, there were these two wretches: Roald Dahl’s nastiest villains. The Twits torment little children, keep monkeys in a cage, and gobble up songbirds baked into pie. They’re beastly as sin. They’re horribly funny. And they’re about to get what they deserve. 😛😛😛😛😛😛😛😛😛😛😛😛😛😛😛😛😛😛 Ha,Ha,Ha, Hilarious. Serves them right. A story you can’t not read.